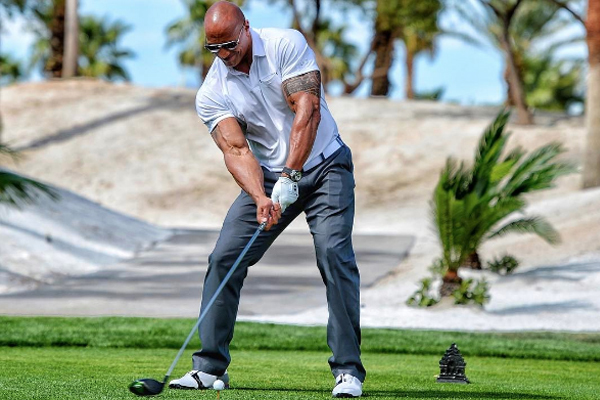 Dwayne “The Rock” Johnson is a very strong, so strong that he can hit a golf ball 490 yards…or so he says. Yesterday he shared a photo on Instagram of him playing golf while filming the HBO series “Ballers.” He also took the opportunity to brag about how far he can drive a golf ball, 490 yards to be precise. “The world record longest drive is 515 yards set in 1974. My drive here measured an estimated 490 yards by the scientists holding the rulers,” The Rock wrote. “I failed math when I was a kid, but I think that’s kinda close. One fun day I will break the world record. Great day on the links shooting scenes for our @ballershbo. Subsequently, I also hit two other great balls … when I stepped on a rake. Ok, no more bulls–t haha. back to work.